No, the title of this article isn’t some attempt at a sensationalistic article title intended to get you read it. I’m really going to “buck the trend” and make a case for why you shouldn’t intentionally build backlinks and why I think this practice can potentially hurt your SEO more than it will help it. I realize I’m probably going to take a lot of heat from this article, especially from the “SEO experts”, but I’m okay with that. First a little background. A few years back, Google’s primary means of evaluating the credibility of your site was via links from other sites to yours. These links are called backlinks, and can either be to your main page or individual pages and posts on your blog. Each indexed page or post on your blog has something called Page Rank, which is a number indicating the quality and credibility of your page (SEO gurus, I know Page Rank is mostly dead, and I’ll get to that in a minute). For example, my main page here at Side Income Blogging currently has a Page Rank of 3, or PR3. Page rank is on a scale from 1 – 10, with 1 being low, 10 being high. A PR0 (zero) means there is no page rank. When a web page links out to another blog, some of that web page’s page rank was credited to the linked page. As a result, getting links from high PR sites, could quickly raise your site’s page rank and therefore your credibility with Google. A few years ago, this met higher SERP rankings. Think of it this way, I’m a blogger and often consult with new bloggers on how to blog. Let’s say you’re looking to start a blog and want someone (like me) to help you, but you want some references first. So I tell you that I helped my neighbor down the road. That reference is pretty meaningless, even though my neighbor takes the time to send you a nice email about me. Why meaningless? Because you don’t know my neighbor, and he has no credibility with you. Instead, let’s say I know Darren Rowse of ProBlogger really well, and use him as a reference. He then sends you an email recommending me. That should be a far more meaningful reference. See the difference? Page Rank and links worked much the same way. Getting links from high PR sites was the equivalent to internet gold, and thus people actively worked to obtain links from any sites with high Page Rank. The problem is that people got a little too over zealous and created all sorts of schemes to get links, including straight out buying them. This of course discredited and gamed Google’s algorithm and really messed things up there for a while. As some of you might have noticed, I used the past-tense for most of this section. Why? Well, many believe that while PR exists, it really isn’t being used much anymore. Is this true? Who knows, as Google hasn’t officially said. But the reality is that most of us don’t even look at PR anymore. I know I don’t. Honestly, I hadn’t looked at PR for Side income Blogging in 6-months or more, and had to look it up for this article. I don’t worry about PR, I focus on SERP positions – That’s what matters. Credibility on the other hand does exist. How Google tracks this internally is anyone’s guess, but Google knows the difference in a highly credible link to your site, and a not so credible link. The more credible links you have, the better off you are. Links from press releases – This is fairly recent one due to the abuse that was occurring. Low quality quest posts – You know, those emails you get saying “I have a great guest post for you…”. I don’t even read these anymore, I delete them. Google has been so open about unnatural link building in the past year, that a number of people have become afraid to link build. I fall into that category. While many people will tell you that Google is not trying to tell people to not build links, they’re just telling you to be cautious, I disagree. Google has been very open about unnatural link building, and how they do not see it as a good practice. 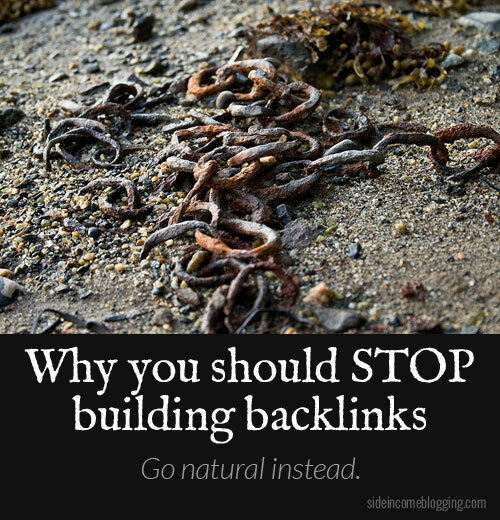 There is a reason for all of that openness, and their message is very clearly intentional, at least as I hear it: Don’t build unatural backlinks. If you don’t think Google is really paying close attention to this, you’re wrong. Try this: build out a bunch of high credibility links too quickly and watch what happens to your site ranking. What does “too quickly” mean? Good question, nobody knows – and that’s intentional. Google is trying to prevent unnatural link building, that is very very clear. If you have somehow convinced yourself this isn’t the case, you’re living a lie and may pay the price in your search engine rankings for it. Natural links are links that occur to your site or articles and you did little to nothing to cause them to occur. These are generally links created by other people. Why? Because they found your content and/or your site compelling and valuable. These are the kind of links you want, these are the new internet gold. I’ll discuss how to get these below. Unnatural links are links that you intentionally set out to get and place, either through asking for the link, paying for the link, getting it through a submission process, or in the worse case, paying for it. These are the types of links that in most cases you do not want. You also want to avoid lots of links to your blog where the same keyword is used. For example, someone placing a link to your site in a footer with the same keywords used on every page. I’ve personally seen this hurt one of my sites. Why? Because it looks like intentional link building with fixed anchor text. While that wasn’t the case, Google definitely saw it that way and de-ranked me for the keyword. There are a few exceptions though that Google has clearly called out and stated are ok.
Social Media Links are links that Google, and in particular Matt Cutts, has stated are acceptable and encouraged. Sharing your content on Social Media, and then getting subsequent Likes, +1s, and re-shares is a great thing. Google frankly loves this as this these types of social indicators provide Google with details on how compelling and valuable your content is. This applies to Facebook, Twitter and Google+. There has been some pretty hard evidence that Google re-shares of your content can and do influence the rankings of your content on SERPs. Plus ones do not, as clarified by Matt Cutts. Guest posting has recently received a little attention from Google’s web spam team. While Matt gave his pretty typical “no answer” answer, he did provide a little insight. Basically, if you host a guest post by a credible writer that creates unique and valuable content for your site, than that is a “win/win” and this type of guest posting is encouraged by Google, even when the post contains a follow link. On the flip side, if you write a guest post for a blog and provide unique and high quality content, this is also win/win for you and the blog. Google is fine with this. Where you want to be careful is hosting guest posts from people you don’t know, or authors that are not well known. You’ll want to be sure that the content is unique and not some re-spun version of content they’ve previously published. If in doubt, “nofollow” any links or don’t include them. Many people are abusing guest posting just to build links, and this type of behavior can hurt the credibility of your site with Google. Guest posts are becoming the new “paid links”. I stopped intentional link building more than a year ago. I used to submit my sites to directories, write articles and post them to some of the article repositories, write frequent guest posts, request blog roll links, etc, etc. I’ve stopped all of that with the exception of the occasional guest post when I have a topic in mind that I think might do well on another blogger’s blog. All I do for social media now is submit my articles to Google+. All other incoming links are the result of people liking my content and wanting to link out to it. My concern is that the lines Google draws are gray….very gray. I am very unclear, unless they specifically call it out, on what’s acceptable and what’s not. I had a site that was earning me around $1500.00/ month for 3 years, and then suddenly was de-ranked and now earns me $100/month if I’m lucky. I never want that to occur again, so I now err very much on the side of caution. Getting your site penalized or having a top ranking article suddenly de-ranked is just too painful and not worth the risk in my mind. So far, the strategy is working. As of the writing of this article, I currently have over 12,000 inbound links. Is this blog ranking as well as it could be? No. Will it over time? I hope so. In the short term, if I intentionally built out backlinks, I think I could be ranking far better, but I’m in this for the long haul. Short term thinking on the web is what gets people in trouble. I know, I’ve made that mistake. I’ll continue to try my best to write compelling and valuable content for people and practice basic SEO. That will be my priority . Time will tell if that’s enough. I’ve stop paying attention building backlink. It take too much time with too little return. More importantly, I am building a brand. When people remember you and like you, they will link to you. I don’t disagree with your approach Larry – but here is how I feel. If Google is going to operate a system that can be gamed, then let the games begin! If links are still being counted as determining ranking factors, and “natural” links are better – then I see no problem with building links that appear natural to Google. I agree that it is wise to steer clear of the black hat stuff. But I personally see no problem with using any of the white hat link building tactics, and some of the gray hat. The problem with gaming is that they eventually fix it, and then you risk being penalized by an algorithm change. The problem I have with link building is knowing what they see as black-hat, gray-hat, and while-hat is not clear at all and any attempts to guess is rolling the dice. I do realize, and fully respect though that this whole thing is a personal choice. Just remember short term vs long term Matthew. Yeah Larry – I know exactly what you mean. And I understand your stance, given that you’ve been burned pretty bad in the past. I also go with the zero manual link building for my main blog. But for my smaller niche sites, I don’t mind playing around with the light gray tactics. As I stated, the key is to make them appear natural and virtually undetectable by Google. If they were to change the algorithm and penalize sites with these types of links, then sites with 100% natural links would get penalized as well. “Intentionally” is the point of all of this. Backlinks are important, no doubt about that. But intentionally doing that, meaning revolving your marketing efforts around that, or making that as your number one priority, and putting content and what your readers want on the back burner is wrong. It’s also nice that you’ve unassumingly define what backlinks are. You’ll never know if your readers truly understand the terminology. Your post, by the way, has been shared on the IM social networking site, Kingged.com. Thanks for writing this up. Personally, I think we should build backlinks but don’t force on it. We should at least try but it is a no brainer to get paid links etc. In some way, I would still say go for some backlinks but instead of forcing them, let them come naturally. That way, it will benefit us in the long run. I agree with about 95% of this article, but more in theory than in practice. In other words, it’s good to do things this way- to be safe. On the other hand, if building links too quickly and too easily actually caused your site to take a dive in the rankings, then SEO just turned super, super easy. All I need to do is build tens of thousands of links to everybody who outranks me in Google. I could use several different automated tools to do this. Yes, in fact, I am going to take down CocaCola.com over the next couple of weeks. I am going to build 10,000,000 links to them and see if I can knock them out of position #1 for the keyword Coca Cola. Now that was an extreme example, but supply and demand tell us that “bad” backlinks are so easy to get, an economist would probably say they ain’t worth more than a fiver. I do not believe your site will plummet if you build bad links. That’s silly. It’s also silly to think you should build bad links- if nothing else, because it’s an exercise in futility. Just like me trying to take down Coca Cola. Actually Michael, in some cases that will work, it’s commonly called “negative seo”. One of my sites had this occur. Some idiot went out and created a bunch of backlinks to my site with the same keyword and it did in fact impact my rankings, pretty significantly. I used the Disavow tool, and a few weeks later they slowly came back. I agree that your Coca Cola example is extreme and not a good example at all because Coke has a ton of reputation and links are not the only thing factored in. So 10,000 links done quickly wouldn’t event dent Coke, but done to a fairly new or smaller site, it can and has. I’ve seen a number of instances where people have reported that this has occurred. There was actually a pretty big discussion about this in one of the G+ communities I’m in. Rand Fishkin at SEOMoz is also aware that this occurs, and challenged people to derank him using the same strategy you outlined, just to test it. Of course SEOMoz is like Coke, tons of reputation, so he never saw any impact, at least that I am aware of. Go watch a few of Matt Cutts videos and he explains that building links too quickly does in fact hurt you and having a lot of bad incoming backlinks also hurts you. That’s the whole reason Google implemented the Disavow tool. So not me saying all of this, it’s Google saying it. Call it silly all you want, but it’s fact. According to me,quality content is the only way we can get better ranking on Google.I stopped backlinking after I found thus out.